As worries and predictions about the effect of Brexit ripple through all available media streams, the reality that emerges for many is that, irrespective of whether you wanted to leave or stay, your business now has to deal with the situation and make it work. There are few, if any, clear outcomes as we all know, but one element that seems to be fairly likely is that we while we will end up with some sort of Switzerway-type modified deal trading with the EU, we will also be introduced to the potential of working more widely with other economies that we already have relationships with and with whom closer trade terms may be developed in the medium term. Countries such as South Korea, Singapore, Malaysia, Australia and of course India have already indicated a readiness to talk when the time is right. So this means that we may have ended up in a unique situation being the only large economy with one foot loosely still inside the EU trade area whilst potentially having the freedom to trade effectively and more competitively elsewhere at the same time. There is little doubt that that position will be thoroughly tested by all sides, and there are no guarantees either way, but there does seem to be the possibility of an upside for UK businesses if things fall in any of a number of interesting ways. Changing the mindset of any company to look at and see opportunity in new markets is always going to be a challenging one, and, moreoever, one that needs something that has seemed to have slightly fallen out of favour – strategic planning. Before considering the opportunity in full it may be important to consider some of the immediate changes in behaviour that companies may face when planning. Within the UK itself, which is of course of major concern for many, there is evidence already that consumers have become passive about, if not actively dissuaded from, making purchasing decisions largely as a result of the inherent uncertainty that the decision to leave has introduced. At the same time corporations seem also to be sensing a potential plateauing or decline in sales and without confidence in future cash flows are delaying or shelving investment decisions. This combined sense of uncertainty about what might happen and how customers, competitors and suppliers might react has the potential bring about a hiatus in the economy as we wait for things to return to some sort of normal. The one thing that is fairly certain, however, is that little will be settled for some time (general predictions seem to favour the first quarter of 2019) so the sooner we start planning for a “New Normal” the better. Those companies whose customers show signs of dithering will need to redouble their efforts to convince consumers to purchase. Doing so through sales-promotion, and constant pricing offers is one route, however there is a danger that this leads only to constant deflation. A better route might be to adopt an approach where companies are constantly looking to increase the value of what’s offered, through product enhancements, extensions and innovation. The UK is still one of the largest and most innovative economies in the world and what remains clear (especially to a certain Cambridge-based technology giant ARM) is that the rest of the world wants a part of that market and the depreciation of the pound has provided a great opportunity for import substitution. Outside the UK market, British companies will have to fight harder to retain the share that they currently hold in EU markets let alone to increase that share. There may be respite in the shape of the pound’s depreciation, making British products more competitive at least over the short term. If companies do nothing else they should all look out their EU price lists and take a good slice off immediately, instantly making the UK offer more attractive than the local supplier offer. If there is more than a little risk up for grabs those same companies might like to consider addressing themselves to the reach that their websites and digital marketing channels give them. The rest of this article is consequently focused on providing a framework which can be used to generate a sense of what opportunities there might be for any business that can look forward at least two years, and to start to develop an approach which can exploit them. We are calling this process an Opportunity Audit which, like other audits, will enable you to take stock of what you have and consider what options might lie ahead. The Audit identifies a number of areas of investigation where potential future opportunities can be researched and assessed for appropriateness. Where do we see opportunity? We see it outside but we also need to look inside the organisation. There is an external but there is also an internal audit to be done. Current product/service portfolio - Do any of the components or our current portfolio have applicability in new ways in light of the changes or, more specifically, in some of the new markets that may be open to us? Brand – Does our existing brand and its collateral, values, positioning, design and so on have the ability to stretch beyond traditional borders and be appropriate and ultimately applicable in new markets? Financial – Do the changes in exchange rates allow any of our products or services to become significantly cheaper in existing or new markets which will allow us to undercut the competition and acquire new customers? Current assets – Do any of our current assets have spare/unused capacity that could be applied to address opportunities in new markets? Staffing and knowledge – Do any of our staff have skills experience or knowledge that could help us exploit any opportunities that already or may exist as the situation develops and new markets become more accessible? If not are they opportunities to recruit staff with such capabilities? Existing Supply Chain – Do any of our existing supply chain partners have other products, connections or operations that could help to exploit new opportunities? Existing Customers – Do any of our existing customers operate in any of these new markets and can we work with them to expand our provision to them or to their networks? Technology – What technology assets or implementations do we already have that could be leveraged to enable easier access to new and existing markets? Partnerships – Do we have any existing partnerships that could be extended or redefined to address opportunities in any new or existing markets? Communications – Do we have any marketing assets, knowledge or experience that could be leveraged to enable quicker and more efficient access to new markets and adapted for existing markets? Within each area we need to establish what specific opportunities each creates and then what activities we need to undertake as an organisation to exploit those opportunities. The diagram below lays out the process. In performing the external audit we need to consider a new approach to evaluating the environment that supercedes the standard PESTER assessment which we are calling the Opportunity Web. 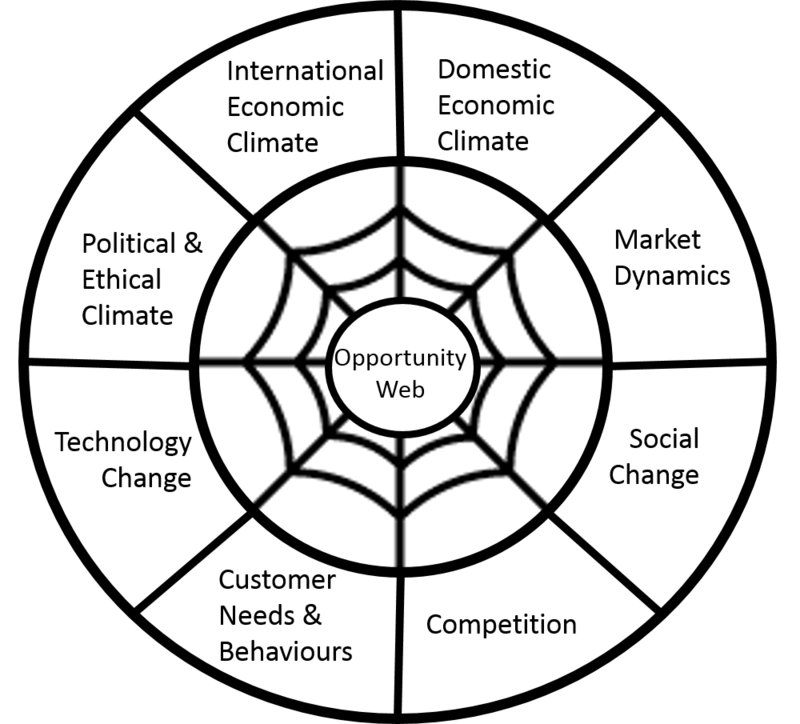 An Opportunity Web can be created which considers not only the opportunities that arise from each element but also the interrelationships between them. Evolving customer needs, expectations and behaviours. This analysis will stimulate the kind of mind mapping that will drive the prioritisation of activity particularly in the search for linkages between operations that allow us to create new offerings. Most obvious of these are cross-selling and up-selling to existing customers and the marrying of technical competence with customer need. Classic historical examples of both can be seen in the insurance industry. Using information gathered from an insurance policy for one person in a household the industry, through the technical skills of actuaries and assessment of risk, is able to identify other risk opportunities that are valid for insurance. It can be extended across all areas from home insurance, contents insurance, travel, health, pet and so on. Another current example exists with mobile phone companies which have gained large customer bases and which are now looking to understand how to apply their technical acumen so they can connect devices to new and innovative customer propositions. In the case Safaricom in Kenya this has been the provision of financial services and cash transactions through M-Pesa. These are just two examples but we need to look deeper and find more within our own organisation by examining the assets that we have and discovering the alternative uses they could be put to. Is it possible to estimate whether this area going to be affected by the changes and if so positively or negatively? 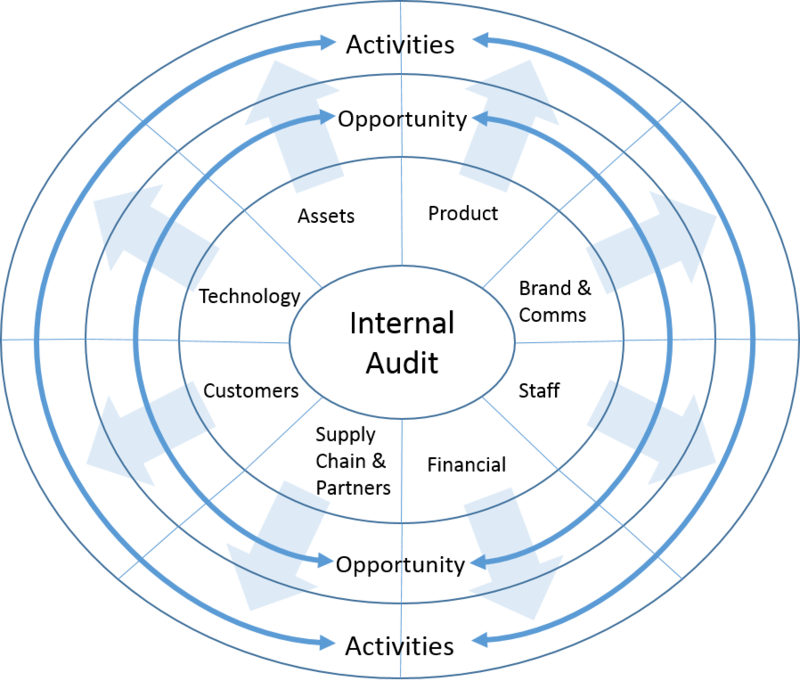 What opportunities can be identified in this area that may result from the multi-market future? What do we need to do to exploit these opportunities? Running through this simple audit with some open brains should produce a clutch of new ideas and opportunities that could stimulate unforeseen activities, partnerships or developments that may have previously been hidden or inaccessible. Then the real work starts! It would seem highly practical for each company to establish a Brexit-focused opportunity committee with marketing setting the agenda, members from as many departments as feasible with the CEO in the chair if possible. The committee should look at the opportunities that are facing the company using the internal and external frameworks over the next 2 1/2 to 3 years with the power to apply resources and take action quickly to exploit any opportunities as they become clear. This could be a tremendously exciting time for the marketing world and a clear and present opportunity for marketers to offer and deliver the insight that will be needed not only to navigate the changes as they emerge internally and externally but to envision the wider opportunities that only really appear during periods of monumental change. Roll Royce does not sell cars?